It's great to have you with us! Thanks for spending time with RTC Insurance Advisors. We are sure you will be happy with your new FL home owners insurance from us. We serve all residence of Florida and we are honored to have you as a client. In order to access your quotes, please either fill out the form below to get your homeowners insurance Florida quotes or contact us at 352-200-2066 to receive a quote right over the phone. In the event you are about to purchase a new home, or if you have already bought a house, no doubt finding a reputable FL home owners insurance company to protect your asset should be of the highest importance. Nobody would want to risk losing an expensive investment, so locating homeowners insurance Florida quotes first is a great start. You will want to make sure your home, and the your valuable contents within are well covered with an appropriate limit of coverage. Liability is also a recommended coverage. If sued, you will have money to pay for litigation. More than ever before, on-line insurance searches have taken the drivers seat with respect to the alternative of having to travel to different agencies in your town. The wait time for a quote has been cut down from days to seconds and you can view the entire market of policies, not just one or two offerings. You can customize your FL home owners insurance policy instantly and have one of our agents complete your application electronically. In order to get the most out of your on-line insurance experience, you should seek assistance from us for your next homeowners insurance Florida quotes. We live and work in Florida and know the market better than anyone else. We have extensive knowledge of the available companies vying for your business to protect you and your family from a potential loss. We can explain to you the difference between sinkhole insurance and catastrophic ground cover collapse. A common peril in our state. 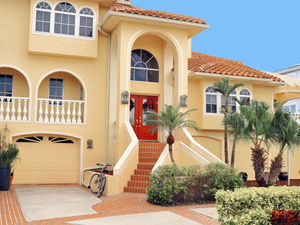 Let us show you what a top FL home owners insurance policy offers. You will receive full replacement coverage for your home. If you need to move out of your home, a rental home or hotel will be provided to you from the insurance company so you have a place to stay while your home is being rebuilt following a loss. If someone is hurt on your property, there is a benefit to help pay for their medical expense. Plus more. We ensure standard coverage features set on your policy. You can lower or take away coverage if you don't want certain benefits. We will ascertain if any discounts can be applied to your policy to help lower your rate such as having good credit or discounts for a central monitoring service to watch out for burglaries while you are away. Please understand that certain types of losses protected under a policy needs to meet insurance company approval. The insurance companies consider many factors such as how old your home is, where it is located, what types of security features it has, and whether or not you've had any past losses to name a few. Make sure you have financial protection from an A rated carrier. Let RTC Insurance Advisors help you find the correct limits of coverage to give ample protection to you. To increase coverage more than a standard policy, we can by the use of endorsements. Maybe you have a golf cart and want to protect it. Policies allow for this add-on. Together, we can break down what is in the policy you are interested in and make adjustments to match what you are looking to cover. With the many choices available, you don't need to over or under insure. Allow RTC Insurance Advisors provide you homeowners insurance Florida quotes today so you can view a listing of FL home owners insurance companies to give us a starting point of figuring out which company is best for you. We may be reached at 352-200-2066 or by filling out the quote form above.